Are you going to a barbecue this Labor Day weekend? We all know these kinds of get-togethers sometimes make it difficult to eat healthy, especially when it comes to what's cooking on the grill. 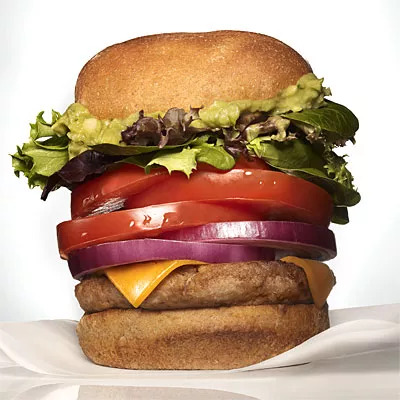 Of course, chicken breasts, turkey burgers, and veggie patties are healthier options compared to a traditional cheeseburger because they're lower in calories and fat, but what if you're in the mood to splurge and have a major craving? (Hey, it's the end of summer after all!) You can still enjoy the real deal without blowing your diet by keeping these tips in mind! Nix your bun (or at least half of it). Not attached to your burger bun? Nix it and try eating your patty between two large pieces of lettuce instead. It might take a little coordination, but you probably won't even miss the bun. Not willing to part with your bun? Try eating your burger open-faced with half of a bun on the button and a piece of lettuce on the top, so you can get the best of both worlds! Try a new kind of cheese. A slice of cheddar can add as many as 100 calories and 5 grams of saturated fat to your burger, so the easy solution is skipping the cheese all together, but what fun is that? Instead of missing out, try mixing grated Parmesan or crumbled feta into your burger patties for some cheesy flavor, but without all of the calories and fat. Buy the best: You'll need to spend a few more dollars per pound, but picking a lean cut of ground beef for your burgers will automatically slim down calories and fat. Plus, the better cut of meat will taste delicious! Pile on the produce: Instead of the usual lettuce and tomato, pack your burger with a variety of produce. Try grilled zucchini, roasted red peppers, cucumbers slices, sprouts, caramelized onions, or sauteed mushrooms. Even fruit, such as grilled pineapple or chopped dates, are a delicious way to add flavor and nutrients to your burger for not a lot of calories and fat. Rethink your condiments: Obviously, a little BBQ sauce or mayo wouldn't wreck your diet, but keep these low-calorie and fat-free condiments in mind when building your burger: mustard, relish, horseradish, hot sauce, wasabi, and salsa. They'll give your burger a burst of flavor without the extra calories, fat, and sugar.